One of the (many) wonderful choices that being retired allows is the ability to see movies whenever you want — during the week, during the day, two in a row on the same day, or 15 over four days at a film festival. And we’ve done all of the above. Most of the end-of-the year lists of “Best” Films have been published already, and most come from critics who review films/books for a living. I don’t have any special film knowledge and just tend to write about how much I liked various films for whatever reasons. Below is a list of many (tho not all) of the films Ellen and I saw in 2016, largely ones that I rated three stars or higher (out of a system of 1-5 stars). If Ellen had a different rating from mine, I have put her ratings in parentheses. As I was constructing this post, I thought of adjusting a few of the ratings (up or down) but decided to leave the ratings the way I made them a day or two after seeing each film. These starred categories are somewhat arbitrary, but generally the five and four and a half star films are pretty close, and I enjoyed those tremendously. The four star ones were all good, but I had some (minor) reservations. The three star ones were more problematic films for me but still may be worth checking out. Three starred ones were even more problematic. If a film did not make it into one of these categories, I did not write a review (The Lobster, for example). If you click on the linked titles below, you will get to my mini-review of that film on MillersTime. For four of the more recent ones, however, I have not yet written about them. I have also attached a link to a listing of these films that you can print out in the event you like to do that sort of thing. To see the above films in a spread sheet for printing, Click Here. We’re just about at the end of our ‘to see’ films for 2016, tho we have two remaining on our list (Elle and Lion) and one this Sunday in our film club. After we see those, I’ll list all we saw in 2016, along with our ‘ratings’ for those of you who may be interested in keeping track of films you might want to see. In the meantime, here are four more we saw recently. Don’t miss the first two. We’ve been wanting to see this one ever since we missed it at the recent Philadelphia Film Festival. When I saw the previews, I wasn’t sure I had missed much. How wrong I was. There are so many good things about this film. The story is one that is told with an honesty and a realism that seem missing in many American films. It is about a man, Lee Chandler (Casey Affleck), who has cut himself off from most of the world and reduced his life to the bare minimum. You eventually learn why as the film develops and as he is unexpectedly pulled into having to take care of his 16-year old nephew. Both Affleck and Lucas Hodges (his nephew) don’t even seem as if they are acting. They simply have become the characters they portray. And the supporting cast, particularly Michelle Williams, is also wonderful. The filmmaking is likewise terrific. 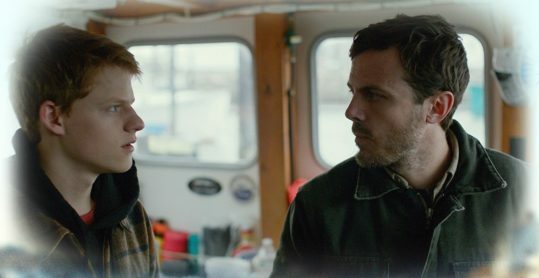 Director Kenneth Lonergan lets the story develop in such a way that the audience is drawn in, not only by the story and the acting but also by the wonderful cinematography and his ability to capture a seaside town in Massachusetts. It’s a good one, maybe one of the year’s best. This film also tells its story without attempting to pound the viewer or to be a polemic. It’s in some ways a small film about a big topic. Based on a true story, Loving is about a quiet, unassuming rural Virginia couple (he is white, she is black) who are in love and marry in 1958. When the local authorities learn of the marriage, they arrest the couple and a judge gives them the choice of going to jail for violation of Virginia’s law against mixed race marriage or to leave the state for 25 years. 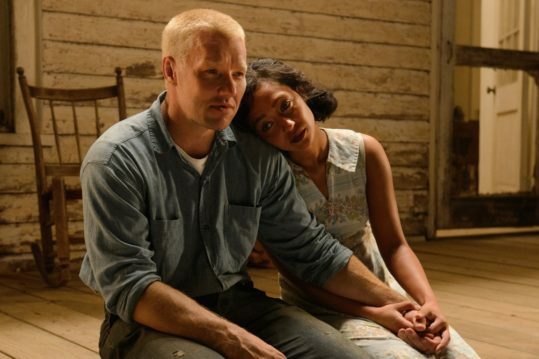 The couple (Richard and Mildred Loving) move to DC and try to continue their life there. Eventually, their rural roots bring them home, and a court battle ensues about their right to be married. It reaches the Supreme Court, and they prevail (1968) as Virginia’s anti-miscegenation law is struck down. The Lovings’ struggle to live as they have chosen and to confront the racial prejudice and laws of Virginia is not told as a big civil rights battle but simply as a quiet story about two quite ordinary people who are in love. He is a quiet, shy person who can’t seem to understand what’s wrong with marrying the person he loves. She is more vocal and expressive and because of her quiet strength (and some outside help), they take on a law and a system that today may seem strange to people who have never known a time when it wasn’t possible for a mixed race couple to marry. Ruth Negga is wonderful as Mildred, and Joel Edgerton captures who Richard must have been. Director Jeff Nichols has chosen to let the story of these two quiet, private people be told without hype or melodrama. Quite unusual in this day and age. While there were insights to perfecting this kind of soup making and eating – “Savor the aroma. Poke the pork, Noodles first.” – I don’t think I can recommend this film. Despite whatever attempts were made to update it, it feels a bit old and moldy. 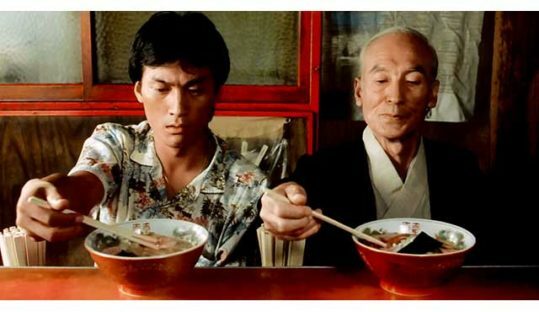 Tampopo is actually about the Japanese obsession with food and particularly with the making of noodle soup. It’s about two guys who take on the job of turning Tampopo (a widowed ‘restaurant’ owner) into the best raman noodle maker in the country. It’s a bit of a spaghetti western (sorry) mixed with slapstick, verbal and physical showdowns, and some tender relationships that build along the way. Basically, my recommendation is to take a soup making course (we did just that in Vietnam) or find the best raman restaurant in your area rather than spend the two hours necessary to see this film. And if anyone has a recipe or knows how to make a burnt miso soup, please get in touch with us immediately. This film has been highly praised by critics and audiences alike. The premise, the distance between a father and his adult daughter and his/their attempt to bridge that distance, is intriguing. But the pranks and weirdness of the father and the coldness and personality of the daughter were too much of a hurdle for me. 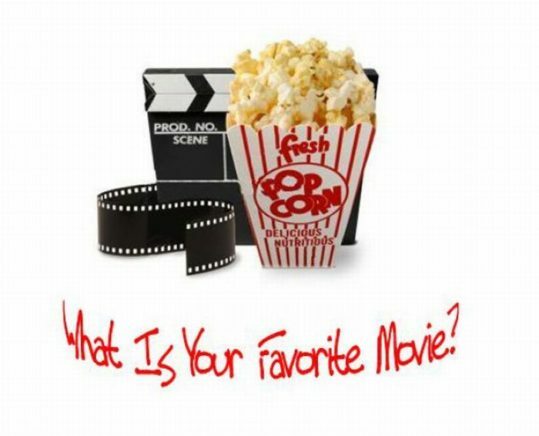 Update: 12/18 – From our our Sunday Cinema Club: 52% rated it Excellent or Good, a fairly low rating. However, 72% would recommend it to others. 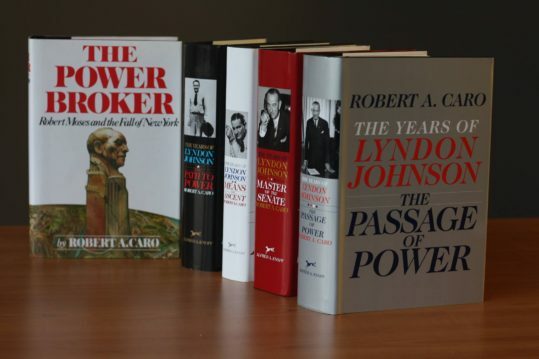 Long time MillersTime readers may remember that author Robert Caro is one of my favorite biographers. His first book, The Power Broker — about Robert Moses but really about NY and about how power really works — won a Pulitzer Prize for biography. He won a second Pulitzer for his Master of the Senate, the third volume in his five volume The Years of Lyndon Johnson. And he’s won virtually every other prize available to historians and biographers. If you know of Robert Caro and his work, or even if you don’t, treat yourself to this recent interview with him in the Paris Review. It captures how he approaches his subject(s), and you will understand why his work is so powerful and so mesmerizing.